Potter Valley is a Mendocino appellation that is rarely seen on wine labels. Matt Karmer (New California Wine) dismissed the area saying, “So far, nothing distinctive has emerged from Potter Valley.” Despite this, there are a number of intrepid souls who proudly farm vineyards (1000+ acres) in this inland sub-appellation located eighteen miles northeast of Ukiah and close to Lake County. I first saw this appellation on a bottle of Kalin Sauvignon Blanc, a white wine of extraordinary interest and longevity. The Russian River Valley finds its headwaters in Potter Valley. On the neighboring hillsides, Pinot Noir has found a home, while white varietals thrive on the valley floor. Sauvignon Blanc, Riesling, Semillon, Pinot Gris and Zinfandel are thriving here as well. The daytime temperatures can be quite high, but the nighttimes are truly cold, making for large diurnal temperature shifts. Early morning river fog makes a regular appearance. Plenty of water is available for irrigation and despite constant spring nighttime frost threats and botryitis pressure brought on by fall rains, Pinot Noir has performed well here and plantings rank second only to Anderson Valley in Mendocino County. The Potter Valley AVA was approved in 1983. 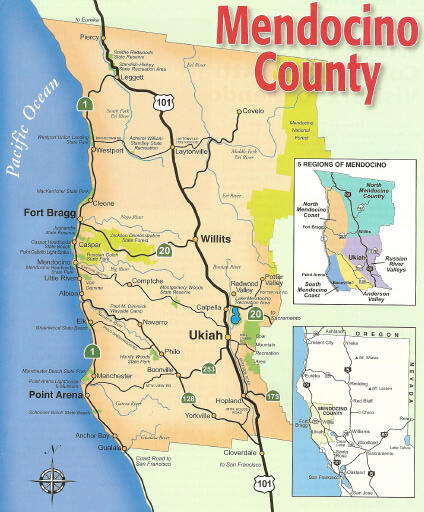 There are no wineries and most locals make their wines in neighboring Redwood Valley. The major growers are McFadden Vineyard, Vecino Vineyards, and Naughty Boy Vineyards. Labels that source grapes from the appellation include Barra of Mendocino, Braren Pauli Winery, Chateau Montelena, Dashe Cellars, Frey Organic Wines, Kalin Cellars, Old World Winery and Sunset Cellars. Jim and Emjay (MJ) Scott are refugee artists (they call themselves “aging hipsters”) that escaped San Francisco in 1989 and settled in Potter Valley. They carefully nurse their five acre organically farmed vineyard (first planted in the late 1990s), handle all of their own sales and promotion and even hand deliver the wine to local accounts. I ran across the Naughty Boy label a couple years back and recently Jim contacted me and sent me a couple of bottles to sample. The Naughty Boy label proudly portrays the Scotts’ faithful winery dog Little Ricky. The winemaker is Gregory Graziano who also farms his own vineyard in Potter Valley. 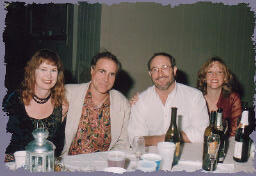 (L to R, MJ, Jim, Greg, Trudy Graziano). 13.7% alc., 477 cases. · Interesting aromatics of wild berries, allspice, herbs and oak char. More red fruits and less tannin than the 2004 vintage. The panoply of exotic fruit and spices is soft and the presentation is elegant. Tangy acidity wraps up a clean finish. This is a mysterious Pinot Noir of unusual breeding that is hard to pin down. I never have tasted anything quite like it and applaud its uniqueness. 14.8% alc., 397 cases, $27. · Red Pinot fruits, soy, spearmint and woody aromas. Red cherry, cranberry flavors which pick up interest and intensity with time in the glass. Light on the palate with a respectable and modest tannic structure and well-integrated alcohol. Naughty Boy Vineyards is located at 10000 Gibson Lane, Potter Valley. The phone is 707-743-2868. The wines are available on the website at www.naughtyboyvineyards.com and are distributed throughout California. Tasting by appointment. These are wines for the adventurous, those seeking distinctive artisan Pinot Noirs that do not run with the usual crowd. A Chardonnay and Rosé complete the Naughty Boy lineup.